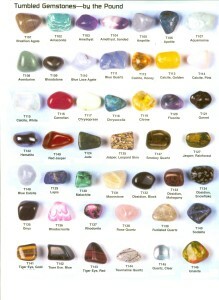 In the late 80’s Fairway Manufacturing Company in St. Louis started work with Eskesen in Denmark to replace the familiar photo real art films inserted in the pen barrels with tumbled gemstones and other natural and man made fillers to mimic the popular Miniature Rock Collection® Pencil line which dates back to 1962. 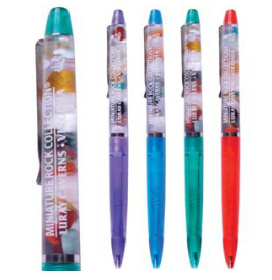 With Millions of Rock Pencils delivered as souvenir and collectibles every year, we believed it was a great idea to add rocks to the pens and the oil enhanced their colours and made them seem larger then they were when looking through the oils the pens had inside of them. We started selling the Floaty pens and Floaty Key-chains that included the tumbled stone specimens floating in an oil filled barrels. They were a HIT! We then decided to offered them with one color souvenir imprinted names and slogans on the colored barrel part. Within a few years we decided to included a clear film inside the barrel that contained a custom imprint that allowed for additional personality in the form of custom logos and more intricate captions with other unique and natural fillers like rice, seeds and more. These Floaty items were ideal souvenir sales for Cave attractions, Natural History and Science Museums, Mines, Jewellery manufacturers, Farms, and attractions that featured gold panning and mining. They are still one of our most popular gifts items to sell to these attractions and many many others. Disney produced a package of Natural American fills to coincide with the release of the Pocahontas movie in 1995. Natural products like seeds, dried corn granules and salt crystals were included as fillers. There’s even a floaty pen Blogger that had an assortment of the Rock fill pens she offered for trade. The Eskesen Pen is one of the most collected and reordered souvenir item with new optional fillers being developed each year. Perfect for beaches or beach front attractions. We can fill these pens with white sand, or regular sand, add a few shells and make a beach scene. Maybe add a small gem for a pirate treasure on the beach. The ideas are endless with what you could add to these pens. 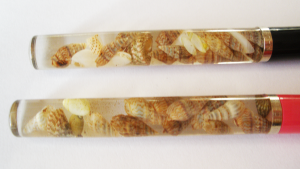 Perfect for gift shops in beach areas or places where you find shells. 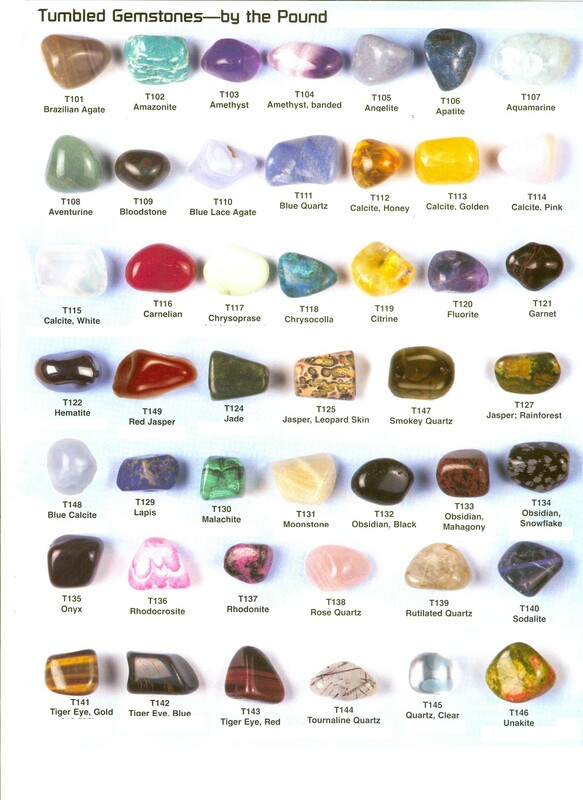 Rock pens can be filled with any type of gemstones. How about gold flakes for a gold mine, maybe silver, copper iron ore, coal…. We can fill these pens with all kinds of things. Do you own a mine or are in a region where mining occurs. These are perfect for caves and other rock related areas. Maybe add some fake gems for a diamond mine or ruby mine. We have filled them with amber for a nice Jurassic feel. How about petrified wood for areas that are popular with tourists for dinosaur bones? Order pens and Key Rings for a combination of products. 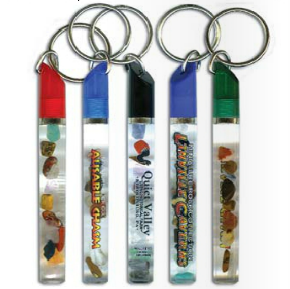 Pens and key rings can be imprinted with your company name, logo and tag line for one low cost. Pencils are very popular. Pencils are not filled with the oil like the pens are. 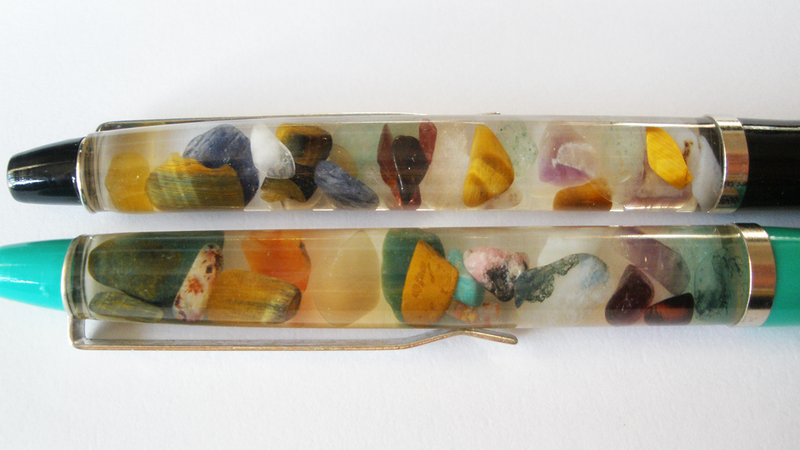 Pencils can be filled with rocks, sand, shells, seeds and more like the pens are. 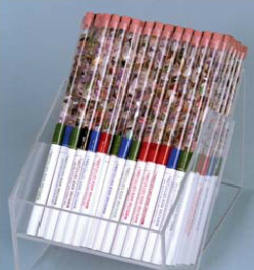 Pencils come with a handy rack to display them in. Fairway still provides stock and custom Miniature Rock Collection® Pens with the Eskesen versions first developed in 1991 and sold to dozens of Show Caves in the US and Caribbean as a souvenir. Look for Fine Faceted crystal filled pens later in 2015 with custom pens produced and imported in quantities as low as 550 pcs per design. We continue to be the main distributor of Floaty pens in North America. If you’re looking for a great product for your attraction that’s a real collectors item, then contact Fairway Mfg. Co. TODAY!! Decide what you want inside your pen/pencil/key ring. Choose the pen or key ring colours you want – Pencils come in white only.